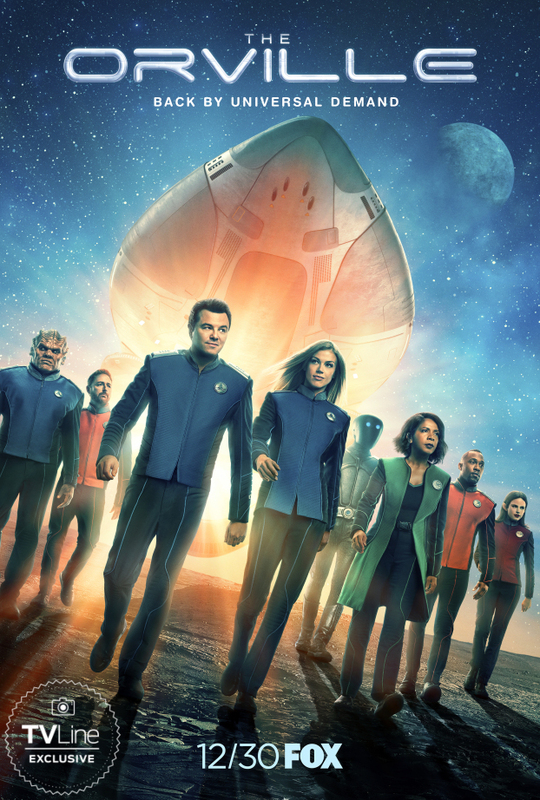 The Orville‘s crew is ready to brave their next missions in the Season 2 poster for Fox’s space adventure series. Set 400 years in the future, The Orville follows the titular exploratory spaceship and its crew, both human and alien, as they face the wonders and dangers of outer space while also dealing with the problems of everyday life. In Season 2 — debuting Sunday, Dec. 30 at 8/7c (following an NFL doubleheader), before returning to its Thursdays time slot on Jan. 3— Ed (played by Seth MacFarlane) and Kelly’s (Adrianne Palicki) relationship will take a new turn, while the Orville crew will meet never-before-seen aliens, face old adversaries the Krill, make first contact with a new civilization and revisit Bortus’ home planet Moclus. Newly recruited for the 14-episode sophomore run is Jessica Szhor (Gossip Girl) in a series regular role, while Leighton Meester (Single Parents, but also Gossip Girl) is slated to guest-star.